ADDIS ABABA, Ethiopia – Weekly Ebola infections in west Africa have dropped to below 100 for the first time in more than 6 months, figures showed Thursday, January 29, raising hopes the worst-ever outbreak of the virus is coming to an end. 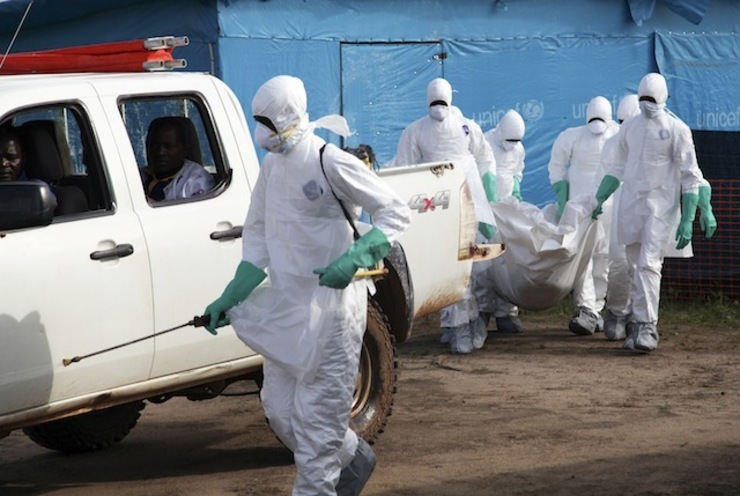 The World Health Organization said it had now shifted its efforts in Guinea, Liberia and Sierra Leone – the countries worst-hit by the epidemic – from slowing the spread to stamping it out completely. The UN's Ebola coordinator, David Nabarro, nevertheless cautioned that the epidemic was still not totally contained. "The number of cases is decreasing week by week and getting to zero in many places... but we still see occasional flare-ups and we still see some surprises with new cases out of our contact lists," Nabarro told Agence France-Presse (AFP). "That means that the epidemic is not contained yet," he told AFP at the African Union headquarters, as leaders gathered a day ahead of a summit meeting where Ebola is a key issue for discussion. According to the WHO figures released in Geneva, 99 new cases were confirmed in the week up to January 25, the first time the figure has dropped below 100 since the end of June 2014. "The response... has now moved to a second phase, as the focus shifts from slowing transmission to ending the epidemic," the WHO said in a statement. "To achieve this goal as quickly as possible, efforts have moved from rapidly building infrastructure to ensuring that capacity for case finding, case management, safe burials, and community engagement is used as effectively as possible." The worst outbreak of the virus in history has seen nearly 9,000 deaths in a year – almost of them all in the Liberia, Guinea and Sierra Leone – and sparked a major health scare worldwide. The 3 nations have been devastated by the outbreak, which began in December 2013, but all have seen recent signs that the virus is on the wane, with the number of new cases dropping weekly. Liberia, once the country worst hit by the outbreak, hopes to have no new cases by the end of February. "We must maintain the effort with even greater intensity, the forthcoming rainy season is a concern," Nabarro said. But he also said there were key lessons from the response to Ebola, and that a proposal to set up an African equivalent to the United States' Centers for Disease Control and Prevention (CDC) would be a step forward. "It took us too long to be ready, we need a better response capacity," he said. "The African CDC will allow the AU to be much quicker." On Friday, January 30, and Saturday, February 1, African leaders are set to discuss the economic recovery of countries affected by Ebola, as well as the setting up a "solidarity fund" and planning the CDC centre, which in its initial phase would operate as an "early warning system." The AU's Commissioner for Social Affairs, Mustapha Sidiki Kaloko, said Wednesday, January 28, it would be operational by mid-2015 – although precise details on the plan have yet to be finalized. "We will start with a coordination center within the AU and then set up to 8 regional centers," Kaloko said. Oxfam has called for a "massive post-Ebola Marshall Plan" for affected west African nations, referring to the United States aid package to rebuild Europe after World War II. "It's clear that Africa's existing architecture for early disease detection, response and control is wholly inadequate," Oxfam said in a statement on Wednesday.